Recently, I was propositioned to be a part of a sustainable info graphic as part of a sale promotion. I decided not to do it for a couple of reasons. It did however get me to thinking. They asked what my number one sustainable tip would be. I wasn't really sure since there are so many aspects to this lifestyle we are trying to live. And with that, we aren't always successful. After a couple days of pondering, I came up with the title of this post. I think this would be it. From utensils, shoes, tools, housewares, to automobiles and clothes. Yes, some things do wear out. But shoes for example- I purchased these shoes over three years. They are the most expensive shoes I've ever purchased. I wear them nearly every day, 5 out of 7 days each week or more. Since purchasing them, I have had the heel tip replaced and recently a portion on each restitched. I've spent about $35 on these repairs. 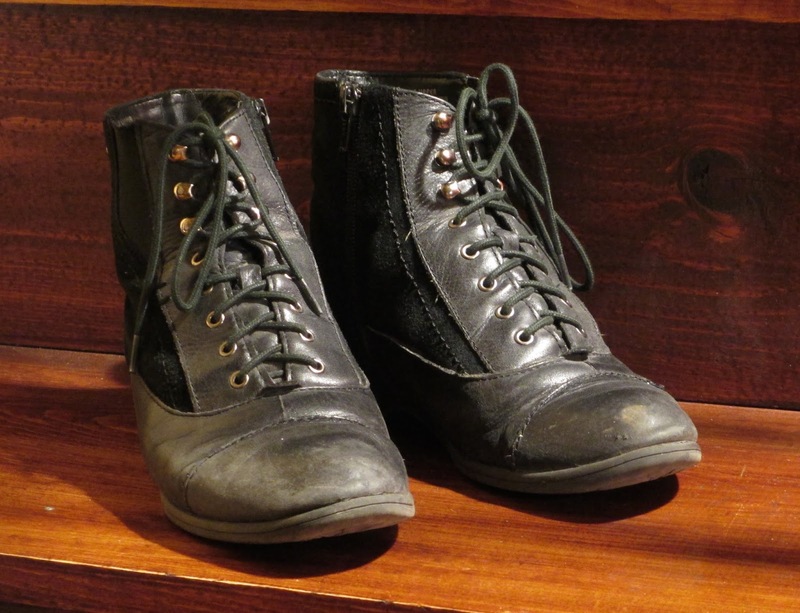 They are still comfortable and are a basic black shoe that should reasonably last another year or two. Maybe more, but if at 5 years they begin to fall apart, I will understand. I keep a list of things I would eventually like to find. About a month ago, I got to scratch one of those things off the list. 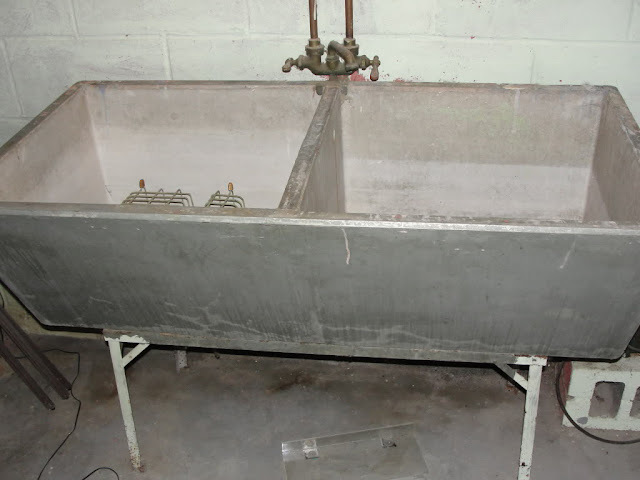 I found a concrete double sink like this one. so a picture of it would be less than flattering. We process any game we are fortunate to get as well as large batches of fruits and vegetables. Our grandmothers knew what they were doing when they used these sinks. They are deep and sturdy = extremely functional. This is an item that was on my list for 2-3 years. The thing is, I wasn't willing to settle. I ran across many of the plastic "shop sinks." and advertised them as yard ornaments with pictures of them filled with flowers. for food and have it properly plumbed. If it was outside with flowers planted in it, the quality would be questionable. The sink we now have may very well out live me. I should never have to buy another one. We buy our vehicles new then use them until they totally conk out. The commuter car Mr.LB is driving has about 327,000 miles on it. The old wood pick-up has nearly 400,000 miles on it. "If you take care of your things, you'll always have something to take care of." into the "I want what I want, and I want it now," mentality. we might find we are able to save significantly. the fact that I don't ever have to think about it again is golden. And in addition, it results in a much more sustainable way of living. read where two pairs of shoes worn alternately will last, of course, more than twice as long. but if three pairs worn alternately last way, way longer. if you get another 400$ maybe two more pairs and use for most of the rest of your life? My Grampagrampa had two pairs he altered back and forth. I had completely forgotten about that. Thank you. I'm not sure we can do it in the next month or two, but maybe after the first of the year sometime. Another pair on hand isn't a bad idea. I too don't mind waiting. I have a list that I keep in my handbag and it comes handy when I'm at a thrift store or a yard sale. Instant gratification can be very expensive. And I find delayed gratification is more satisfying. Me too. I had a list in my purse, but finally put it in my phone so it wouldn't be a crumpled mess. Congratulations on finding your sink. Delayed gratification works for me as well. The search is part of the fun, I think. I coveted a pair of similar, though brown, shoes of my cousin's when I was a kid :o). Do you mind sharing what shoes they are? I had to look in the shoe 😋 They are "earth" brand. They have been comfortable from day one. Typically after a few months, I start getting headaches as the shoes break down. These have held up well. And don't forget your cottage 😊 Those older Kenmore washers and dryers last forever! I love this post as I tend to keep using things until they are more than 'dead'. LOL But things just don't seem to last like they should...I've bought two items recently that lasted less than a year! If you discover they don't work before the warrenty is out...well, good luck with that....never seems to work out for me. I do have a Maytag dryer that is 42 years old and my house is 111 years old, so some things do last a long time. I'm just trying to use less. love that sink have been thinking of adding one to our house. Amen to that. I have dresses and skirts that I bought when I started teaching that I still wear, a pair of cowboy boots that I have had since high school, a second hand hand grinder, the plates we got when we were married. It takes an act of God before I replace something. Your sink is wonderful and long live the wood pick-up. Oh that sink! Both my mother and grandmother had them and I wanted one too but ended up having to settle for one of those plastic (or whatever fancy name they give it to pretend it's not plastic) sinks. It was supposed to be "heavy duty," but one has to ask - compared to what? Your tip is so great and it's a shame that it's getting harder and harder to find anything that lasts even 6 months ,let alone a lifetime.